This print (circa 1776) provides an impression of one of the great bells associated with both the Palace of Westminster and St Paul's Cathedral. It has an interesting history and the print itself raises a number of questions. For many centuries a clock striking the hour on a bell was a feature of the Palace of Westminster. The original clock tower stood on the northern side of New Palace Yard near to where the current clock tower housing ‘Big Ben’ stands. 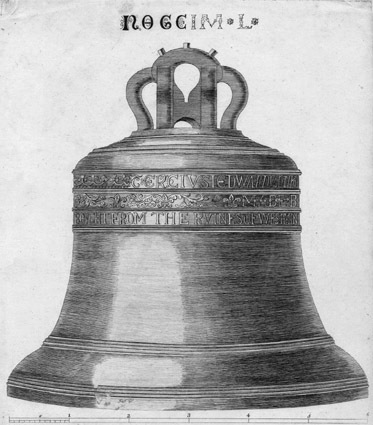 The history of the bell is that Sir Ralph-de-Hengham, when Chief Justice of the Kings Bench, caused a court roll to be erased and reduced a fine. For this action he was himself fined 800 marks by Edward I. The money paid was used between 1288 and 1290 to erect a tower containing a clock and bell, which struck the hour to remind the judges who sat in the adjacent courts of Westminster Hall of the offence of one of their predecessors. We know this tower (described by some writers as ‘the clock tower opposite Westminster Hall gate’) later contained a large bell cast in the reign of Edward III. The clock tower can be seen on the far right opposite Westminster Hall. Henry III, who was instrumental in building the fabric of Westminster Abbey, appears to have taken an interest in bells. An instruction in the Close Rolls, dated 1230, asks Edward of Westminster to make a bell larger than any he had previously made for the Abbey. Edward of Westminster is otherwise unknown as a bell-founder, and it seems likely that he may simply have been the contractor who put the work in hand. Later references in 1249 concern the commissioning of two great bells for Westminster Abbey. It would appear that too much metal had been ordered, for in February 1250 Edward of Westminster was ordered to arrange for Master John-de-Seynt to cast four bells for Windsor Castle chapel ‘out of the metal which remained from the great bell of Westminster’. Two years later in 1252, he was ordered to make immediate arrangements for ‘the hanging of the great bell so that it can be sounded on the vigil of St Edward’. Around the same time the building of a separate bell-tower, or clochard, was begun. This stood at some distance from the Abbey, in what is now Broad Sanctuary, on the site now occupied by Middlesex Guildhall. This tower was demolished in 1750. Although the Sacrist's rolls show that the Abbey spent money on the repair of ‘the great campanile’ at various dates in the 14th and 15th centuries, there is also reference to bells ‘in the little campanile’. The accounts for 1478/9 show a payment to John Freeman for work undertaken ‘in various parts of the Church, in the bell-tower (Campanile) of the Church and in the great bell-tower in the Sanctuary’. This suggests that the bell-tower in the Sanctuary might have been built as an appurtenance to the royal chapel of St Stephen's in Westminster Palace. 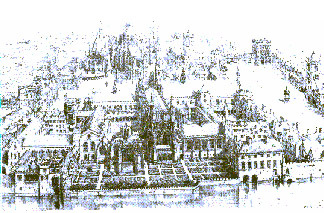 This was the view taken by John Stow (Survey of London: 1598) — ‘He (Edward III) also built to the use of this chapel (though out of the palace court), some distance west, in the little Sanctuary, a strong clochard of stone and timber, covered with lead, and placed therein three great bells, since usually rung at coronations, triumphs, funerals of princes and their obits’. Although suggesting that the clochard was built in about 1347, we know it was already a hundred years old by then. Edward III may therefore have simply had it repaired. An entry in the Sacrist's rolls for 1428/29 probably refers to bells in the clochard. At that time, a founder named Vincent cast (or possibly recast) a ‘bell called Jesus’ at a cost of £11, and repairs were carried out to ‘the great bell named Edward’. An entry for 1478/49 is more definite, and seems to imply that at the time there were more than three bells in the clochard: ‘For the making of a clapper for the second of the three smaller bells in the great campanile in the Sanctuary, xs’. Another entry for 1495/96 speaks of two bells in the great campanile, called Holy Trinity and Edward. The last entry in the Sacrist's rolls referring to bells is for 1516/17 when one of the bells was recast. It is possible that there is some confusion here, which has certainly existed in later writings, with the clock tower of Westminster Palace. Whether a large bell had been transferred from either the Abbey or clochard in Broad Sanctuary to replace an earlier bell in the clock tower in New Palace Yard is unknown. The large bell in the clock tower was originally known as ‘Edward of Westminster’ (possibly after Edward the Confessor), but later came known as ‘Great Tom’ or ‘Westminster Tom’. However, as St Edward is genitive and the grace/beauty is ablative, the second line may have been intended as a pun with the alternative inference ‘So that the hours of St Edward [presumably the Confessor, but possibly Edward of Westminster the original contractor] may be marked with grace/beauty’. With the arrival of clocks many hour bells became redundant. In the course of time the tower itself fell into disrepair causing William III in 1698 to give the tower and bells to the parish of St Margaret's Westminster. The tower was pulled down in 1707 after the great bell had been sold to St Paul's Cathedral. Great Tom was found to weigh 82 cwt. 2 qrs. 21 lbs, and was bought for 10d (i.e. 4.16p) per pound weight giving a total price of £385.17s.6d (i.e. £385.88). It is interesting that in 1706, however, that the Treasury received a petition asking for ‘a good large sundial’ to take the place of the demolished clock and bell. SANCTI DECORE EDWARDI SIGNANTUR UT HORAE. Many of Wightman's bells were much admired, and there are still some good bells by him in existence in the Home Counties, but evidently his recasting of Great Tom was a failure. It is reported to have weighed nearly 9cwt less than the original bell and lasted only about a year before it was replaced. This time the casting was entrusted to Richard Phelps of the Whitechapel Foundry, who supplied a new bell in 1709. This bell was delivered to the Cathedral before the old one was taken away. RCHARD PHELPS MADE ME. 1716. Some time has been spent considering the legend at the top of the print. It is unusual in appearing to be a mix of letters (some filled in) and roman numerals. Other copies of the print contain the same filled in letters showing this to be original rather than added later. The most likely explanation for the legend is as a print reference to the original publication from which it was taken. A footnote to the print, which appears to have been taken from another related page, further suggests that metal was added to the original cracked bell (i.e. around 82 cwts) to create a bell weighing around 84 cwts in 1708. The assertion that it was 9 cwts lighter in weight is therefore contradicted by this account if it is correct (i.e. 8,400lbs is equal to 83.6cwts). It is also interesting that the diameter of the bell at its lip is shown to be six feet (i.e. nearly 2 metres). Finally, the footnote further suggests that the bell was still in use in 1772. Is this a misunderstanding, a reference to the later recast bell, or did the 1708 Great Tom find another use after being replaced at the Cathedral in 1709? The history of Great Tom of Westminster follows a number of turns that still do not appear to be fully understood. The discovery of this early print has raised a number of questions that may help to complete the story in the future.